After numerous postponements, the full closure of the Warrandyte Bridge is set to happen this weekend. Being the first weekend in May, it is also the Warrandyte Riverside Market. One lane of the bridge will be closed, with traffic management onsite, to help keep the traffic moving. The Warrandyte Bridge will be open as usual, this should reduce the impact of bridgeworks to stall holders and visitors of the Warrandyte Riverside Market. Full closure of the bridge to vehicular traffic. Cyclists and pedestrians will still be able to cross the bridge, under the direction of traffic management. Although the Total Fire Ban period has officially ended in both Manningham and Nillumbik, VicRoads stress that scheduled bridgeworks may be modified/postponed to ensure the public safety and the efficiency of the emergency services is not impacted by bridge widening. With a number of local events taking place this weekend, including the Kellybrook Cider Festival and Nillumbik Artists Open Studios, additional journey planning may be required. Both private and public transport will be affected by these works. VicRoads have provided a map illustrating the traffic detours. There will be four detours in place; (purple, green, yellow and orange). All the detours start/finish on Main Street, Eltham, north of the river and cross the Fitzsimons Lane Bridge. People travelling to Warrandyte are encouraged to follow the purple diversion which takes them down Heidelberg-Warrandyte Road. For those travelling to Park Orchards and Warranwood and the South Warrandyte/Ringwood borders; the green diversion along Reynolds Road and Falconer Road is suggested. For everyone else looking to travel between Eltham, Kangaroo Grounds and beyond, and Everywhere South and East of Ringwood, the yellow diversion (along EastLink) or the orange diversion (Box Hill and Whitehorse Road) is advised. Full details of the diversion routes can be found under the diversion map. During the bridge closure, PTV bus services 578 and 579 (Warrandyte Reserve to Eltham Station) WILL NOT CROSS the Warrandyte Bridge. According to the Public Transport Victoria (PTV) website, PTV do not anticipate any disruption to the 906 and 364 bus services. 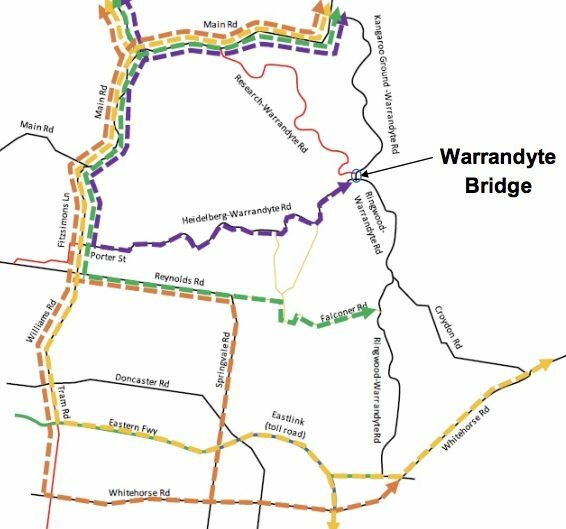 The Warrandyte Diary will keep an eye on the forthcoming bridgeworks and communicate any changes via our website and on social media.